Take the protein percentage challenge. You will be amazed how other protein powders numbers add up in this equation. 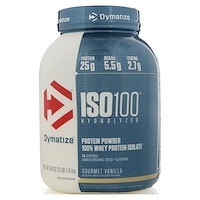 Dymatize ISO·100 derives its name from its protein source, 100% Whey Protein Isolate. Unless you are in the medical profession, you have probably never seen protein like this before. Most companies "claim" they use Whey Protein Isolate, but after one serving of Dymatize ISO·100 you can instantly see, taste and even feel the difference! Our Whey Protein Isolate has been processed to the zenith of perfection, 100% hydrolyzed and instantized and taken through no less than 5 quality controlled steps. Both lactose and fat have been removed from ISO·100, leaving you with nothing but the most easily digested, assimilated and most bio-available source of protein on the market. We know that maximum protein utilization is essential to aiding muscle recovery and maintaining a positive nitrogen balance, which is critical during periods of intense training. There is no higher standard of protein than ISO·100, so feel confident that you will be feeding your muscles to their fullest potential! Check the stats: each serving has an astonishing 25 grams protein, with "0" Carbs & "0" Fat.† Looks closer. You will see that all this is in a serving size of about 28 grams, making ISO·100 90% protein by weight! Nothing out there matches our formula, nothing even comes close. The meticulous processing of Dymatize Whey Protein Isolate gives you "instant mixability" in its true from. 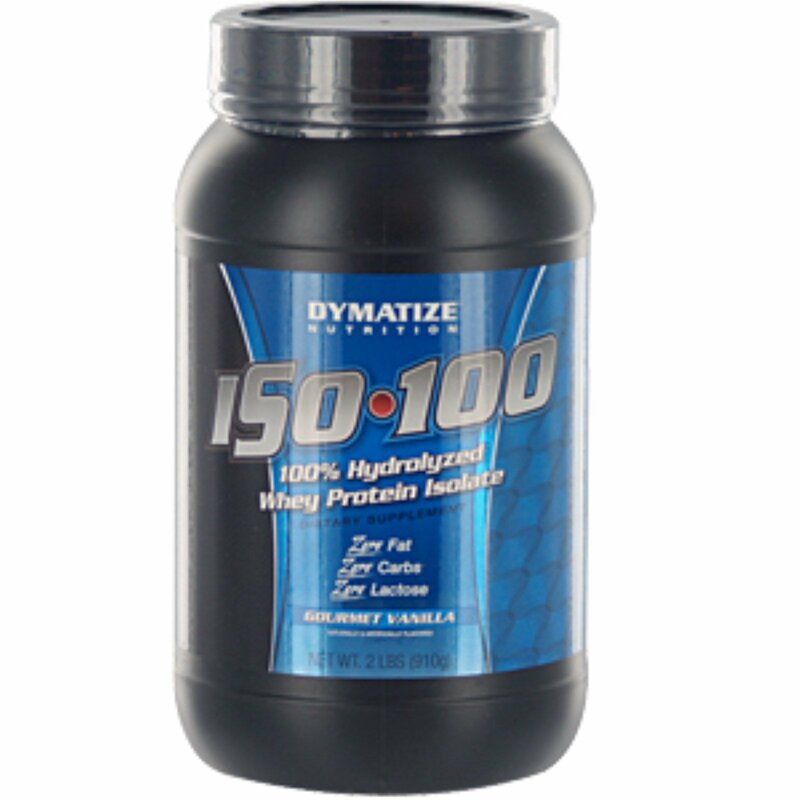 You won't believe how quickly Dymatize ISO·100 goes into solution. And, because if its ultra-purity and zero lactose, Dymatize ISO·100 could be the easiest protein to digest on the market today. Don't forget, with zero carbohydrates, Dymatize ISO·100 is perfect for low carb diets. As a dietary supplement, add one heaping scoop to 12 ounces or 350 ml of water, juice or milk. Mix for 15 seconds or until completely dispersed. For maximum results, take 2-3 servings daily. 100% hydrolyzed whey protein isolate, natural and artificial flavors, soy bean oil, potassium chloride, sodium chloride, silicon dioxide, sucralose. Contains milk and soy. # Naturally occurring. Not added or manufactured.